The Embassy Suites West Palm Beach Hotel recently re-opened after completing a $31 million renovation/ rebuild project emerging as West Palm Beach&regs premier hotel and meeting venue. The Embassy Suites West Palm Beach Hotel showcases 219 guestrooms, including 115 deluxe rooms and 104 one-bedroom suites. Business travelers visiting Commerce Bank, Fidelity Federal/ National City Bank, Rinker Materials, Thermo Electron, Ernst and Young, Progressive Insurance, or Wachovia, will find Embassy Suites West Palm Beach the perfect location to meet, relax and work with over 18,000 square feet of meeting and function space. For groups of 10 to 700, the Embassy Suites West Palm Beach Hotel is the perfect choice for your next event. 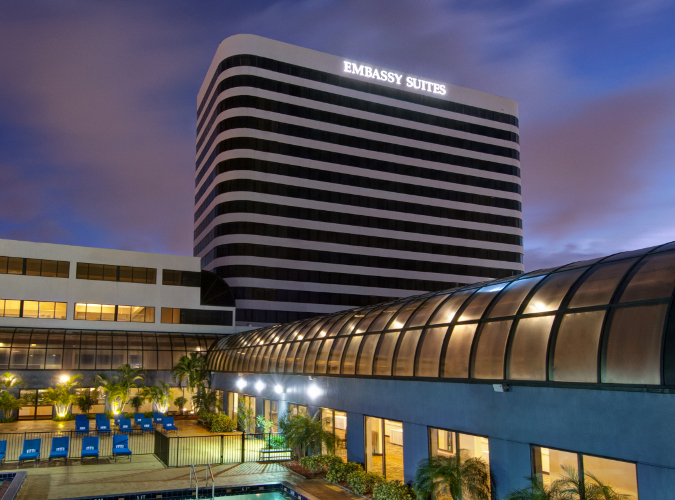 The Embassy Suites West Palm Beach Hotel is conveniently located just across from Palm Beach International Airport and just minutes from the business/ entertainment district of West Palm Beach. This hotel is committed to providing accessible facilities under the American Disabilities Act. If your accessibility needs are not met, please contact the Hotel Manager on Duty. Should you require additional information regarding accessible facilities for guests with disabilities, please call 1-800-Holiday (U.S. and Canada) or contact the hotel directly. For the hearing impaired, TDD service is available at 1-800-238-5544 within the U.S. and Canada.